This image is reportedly our first look at a brand new Prince of Persia game. It was posted by a user on Ubisoft's official forums, and down the bottom you can see the term POP_ZERO_2. Is it real? Who knows, we're asking. Is it interesting? You bet. 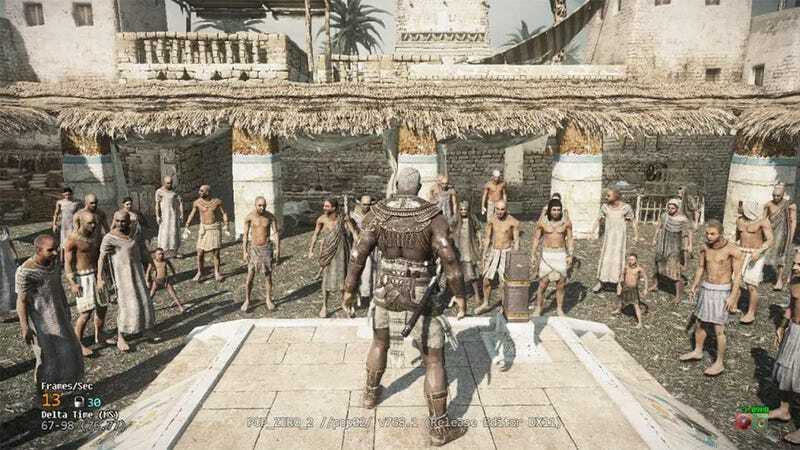 If it is real, that's not just a black Prince, it looks to have at least part of the game set somewhere closer to Egypt than the series' traditional Persian stomping grounds, going by the clothing on that crowd. Prince of Persia Zero was the codename for an aborted attempt by Ubisoft a few years back to do something radical with the franchise, like taking it into the present day. While there are signs this really could be from an in-development build of the game - the crowd is "floating", the visuals are pretty rough and they all appear to be looking straight ahead...at his junk - I also shouldn't need to tell you how easy it is to fake something like this. Still, because it's so interesting, here it is. We'll update if we hear back from Ubisoft. UPDATE - Check out these pics posted on NeoGAF back in May. From what can be made out of the silhouetted man's outfit and the those of the crowd behind him, it certainly looks similar to the image up top.